If you’re a fan of public transit, maybe you should try some solar transit. 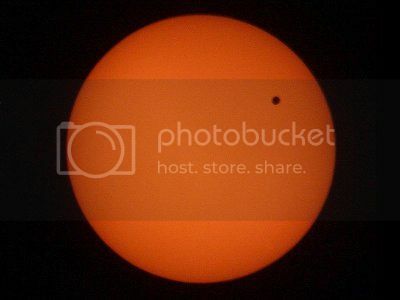 This week, Big Picture Science is featuring a special show on the upcoming transit of Venus, a rare celestial event that happens just twice about every hundred years. Earth’s fiery twin will cast a tiny black dot as it crosses in front of the Sun on June 5th or 6th, depending on where in the world you’re viewing it. Here in North America, it takes place June 5th, starting at 3:06 pm in California (PDT). The last transit [pictured above] occurred in 2004, and this year’s occurrence will be the last of your lifetime as the next doesn’t occur for another 105 years. See the end of this post for tips on watching it. The transit of Venus isn’t a mere astronomical curiosity – it played a crucial role in determining the size of our solar system. While millions of people will probably watch this year’s transit, just two people saw it the first time in 1639: an Englishman named Jeremiah Horrocks and his friend William Crabtree. You’ll hear about how Horrocks converted his room into a giant pinhole camera, and calculated the distance between the Earth and Sun by measuring the size of the dot made by Venus. He was off by 30 million miles (48 million km), but he came closer than any previous estimate. Then you’ll hear about English astronomer Edmund Halley, who described how to obtain a more precise estimate of the size of the solar system by timing when Venus slid across the edges of the Sun’s disk. Yet Halley wouldn’t live to see the Venus transits in 1761 and 1769. Transits occur in a pattern 8 years apart, then 121.5 years, then 8 years, then 105.5 years. The whole thing repeats every 243 years. Hear about how astronomers observed the transit from all over the world. This planetary party during the 1769 transit marked a major milestone in international scientific collaboration. Leading one team was the explorer Captain James Cook, who voyaged to Tahiti to see it (as part of a secret mission to explore the South Pacific). Find out what the black drop effect is (hint: it’s not an amusement park ride), and why it made it so difficult to time exactly when Venus entered and exited the circle of the Sun. Seth and Molly take us through the fascinating history of transits of the second rock from the Sun. The next time someone asks you, “what’s the distance between the Earth and the Sun?” you’ll be able to tell them not only that it’s 93 million miles (150 million km), but how we found that out. • You can find out your local transit time here: http://transitofvenus.nl/wp/where-when/local-transit-times/, **keeping in mind that daylight savings time adds an hour to the times shown. • Don’t stare directly at the Sun (which is good advice in general). Use proper eye protection: http://www.transitofvenus.org/june2012/eye-safety. • The best way to see the transit is with a telescope or binoculars with a solar filter. Failing that, you can use eclipse glasses (make sure they aren’t scratched!) or #14 welding glasses if you happen to have some. Or use a pinhole camera. Be sure to listen to the show to hear more, and tell your friends!